Over the years Minonk has had a quite diverse mixture of ethnic groups for a town of its size. The original settlers of Minonk were of German, English and Irish extraction. The German and the English engaged in farming. The English were mostly from the eastern states. Many of the German people in the Minonk area came from the Ost Friesland area of Germany. This area is in the extreme northwest corner of Germany bordering Holland. That area of Germany is basically flat farmland remarkably similiar to the Minonk area. Immigrants would often follow each other into the new world and also seek areas similar to their homeland. The Irish were also immigrants and had come to work on the railroads. Many of the Irish used money they had earned from the railroads to buy farmland. The English and German were Protestant while the Irish were Catholic. When the Minonk coal mine started to expand its operations it recruited many of its workers from Eastern Europe, especially Poland. Soon the Catholics outnumbered the Protestants at that time although now the reverse is true. 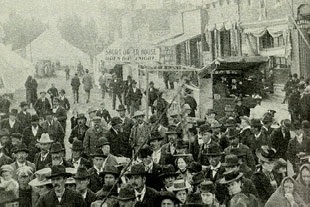 The above photo is of a street fair looking west down West Fifth street. Initially, both the Irish and the Polish attended the Catholic church in the southwest side of Minonk. However, the cultural differences between the Irish and the Polish resulted in the Irish building the St. Patrick's church on the east side in 1890 while the Polish built St. Barbara's church on the corner of Ninth and Washington streets in the northwest side of Minonk where most of the Polish miners lived. The church was torn down years ago. After the Civil War, some black families moved to Minonk to work in the brickyards and the coalmine. These families lived in the north block of Maple Avenue (then called Cemetery Road) and North Chestnut Street, which were near the coalmines and the yards. They attended the African Baptist Church in Minonk. Racial intolerance was very much in effect during that time period. However, there was some interracial socializing including one interracial marriage. A prominent black musician by the name of Artie Mathews was born in Minonk. He became a well-known ragtime pianist in the earlier 1900's. The only black person to graduate from Minonk High School was Susan Ford in 1896. Due to economic and social conditions there were no black people left in Minonk by the 1920's. A few Oriental families lived in Minonk in the earlier 1900's and operated laundries, a profession that was quite common for Oriental people at that time. The Paloumpis brothers, Tom and Nick, who were Greek immigrants, came to Minonk in 1915 and established a confectionary business and sweet shop that became well known all over Illinois for its candy. The sweet shop was closed in the 1970's but the candy making business has been passed on to the new owners who continue to sell the original Paloumpis candy recipes under the name of Cunningham Candies. Max Leiken, who was Jewish, came to Minonk in the earlier 1900's also and eventually ran a car agency on South Oak street. One of his sons Isadore started a law practice that is still in existence at the corner of Fifth and Chestnut and run by Isadore's son Ned.